The concept of using more than one kind of media to tell a story (cross-media or transmedia) stories has blossomed. An icon of modern synergistic storytelling was The Matrix/Animatrix/Matrix Reloaded where a narrative arc was split between three movies and characters appear in the movie narrative as a result of the plot of the Enter the Matrix computer game. Unless you were a complete Matrix-head, you may not have realised and have even thought that Niobe's sudden appearance in Matrix Reloaded was a deus ex machina rather than a bold experiment in synergistic storytelling. The what, where, how, why and when has been summarised nicely by Christy Dena. Yet there's the idea that events or decisions taken at the beginning of the story have an impact on the story or the information provided. Like the Fighting Fantasy books where choices made early in the narrative provide options (or equally deny them) later on. A variation on this was trialled by IBM researchers in research on interactive cinema how actions early on in the story cause impacts later on in the story environment and has repercussions for Internet browsing. So can such deep wisdom be applied to tabletop gaming? Of course it can. 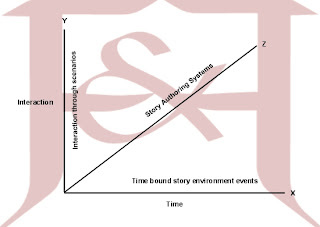 The diagram opposite posits an interesting viewpoint, that story authoring systems can increase interaction in an environment with time-bound story events. By story authoring systems we mean players, games masters/referees and in some cases even AI systems dealing with characters or environment. Which brings me onto random tables - used by all of them. Some of the finer points of these are explored by lumpley games' In A Wicked Age and the resulting Abulafia oracles as well as cards in Ravenloft to provide situational modifiers. It was observed that the use of random encounters is something peculiar (though not unique) to D&D in it's various incarnations. As prototypical story authoring systems, these tables have led to significant impacts on games - not always to the positive. An anecdotal tale (which I recall being from Michael Stackpole) about how a sci-fi RPG game died in the first 10 minutes when the DM rolled an asteroid collision despite a pilot's awesome 'avoiding asteroid' roll and all the players bar one just nodded their acceptance and then put the game away for the evening. The anecdote illustrates these systems are best applied judiciously. Some older grognards may claim this is unfair to the 'roll it and see' playstyle. I personally think that if you are going to create a space opera, you don't finish 10 minutes after the start because the director thought it'd be gritty to have a big rock kill you all. Personally, it's a bit unsatisfying and it closes the story too early. In this instance, I follow the Rule of Cool over the Rule of C4 and yes, this is really a cosmic case of "Rock Falls, Everyone Dies" rather than a strict use of the Rule of C4. Going back to cross-media, how would you feel about games that marketed itself by different media - not in a D&D Insider or Dungeon-A-Day manner (which provides content as the be-all and end-all) but to provide clues to a setting or story arcs or snackies for DMs?